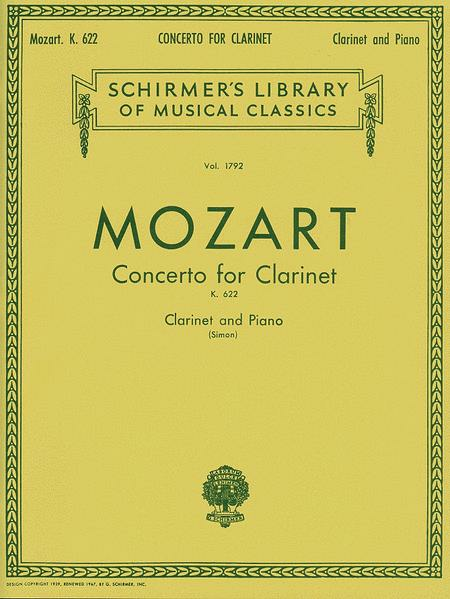 Composed by Wolfgang Amadeus Mozart (1756-1791), lyrics by Eric Simon. For Bb clarinet and piano accompaniment. Schirmer Library, volume 1792. Format: set of performance parts (includes separate pull-out clarinet part). With solo part, piano reduction and performance notes. Classical period. Bb Major. 48 pages. 9x12 inches. Published by Schirmer. ISBN 0793555841. With solo part, piano reduction and performance notes. Classical Period. 9x12 inches.